In an effort to get more viewers to tune in, Fox’s “American Idol” is tuning up its interactive appeal through a digital collaboration with Google and Facebook. The long-running singing competition has been facing its own competition as similar performing programs have been vying for their share of primetime TV viewers. As a result, the producers of “American Idol” are tapping the technology of Google and Facebook to amp up the voting experience with intriguing interactive features. LATimes.com offered a behind-the-scenes peek at the show’s new digital direction. “Now more than ever, we’ve got these incredible technology platforms that can be used in real time to not only reflect what’s happening on the show, but to create a two-way dialog between the viewers and the show itself,” said Bill Bradford, senior vice president of digital for Fox Broadcasting. While fans have always gone to Google to search for stories on the show, contestants, and judges, they will now be able to cast their votes for their favorite finalists directly from Google search. In addition, Facebook will provide in-depth news and views on the voting process to keep viewers and voters up-to-date on the most recent results in real-time. 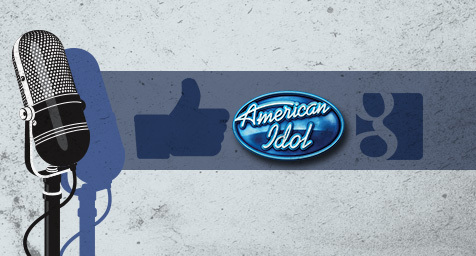 If Facebook fans agree, they may even see their profile photos and performer picks shown on-screen during the show. While “American Idol” still attracts millions of viewers, the show had to face the music that its ratings had been on a steady decline. That’s when Google popped up and proposed adding innovative interactive voting elements that would it make it easier than ever for viewers to vote whenever they use their computers, smartphones or tablets to search for stories about the show. The new voting features will debut in time for the show’s finalist performances on Wednesday, February 26. Fans will be able to vote via Google by searching for show-related terms. Then, they will have the opportunity to share their votes on Google+, as well as follow contestants, join community conversations or just hang out in Google Hangouts about the show. See what’s new on the social media scene. Contact MDG Advertising today at 561-338-7797 or visit mdgadvertising.com. MDG Advertising is a full-service advertising agency and one of Florida’s top branding firms. With offices in Boca Raton and New York City, MDG’s core capabilities include creative, branding, logo design, print advertising, digital marketing, mobile marketing, email marketing, media planning and buying, TV and radio, outdoor advertising, newspaper, video marketing, Web design and development, content marketing, mobile marketing, social media marketing, and SEO. To discover the latest trends in branding and advertising, contact MDG Advertising today at 561-338-7797.